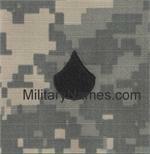 ACU UCP BLOOD TYPE TAPES with Hook Fastener Military Name Tapes & Rank Insignia. Leather Flight Badges for all Branches of Service. ACU UCP BLOOD TYPE TAPES with Hook Fastener . The tapes are made from the same digitized fabric as the ACU Uniform and come with hook fastener, Hook Fastener or equivalent. The tapes are made 4 inches long to fit perfectly on the sleeve Hook Fastener .